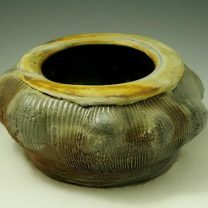 This class will explore the vast subject of ceramic form and surface. Jeff will show you how to utilize tools, texture, and slip along with necessary techniques for developing personalized surfaces for both functional/non-functional forms. Discussions will take place about surface design and decoration, various aspects of utility, scale, and the importance of intent. You’ll have one-on-one interactions in a creative environment where experimentation is encouraged and individual development is nurtured. Some clay experience is required. Curiosity and a sense of humor! I have been working in clay since 1991. From the outset, I somehow knew ceramics would be apart of my artistic and professional careers. Like with so many others, I continue being ever more intrigued and amazed at the potential of this plastic material. Over the years I’ve sought out inspiration and people to further my education in clay. Working for or assisting various artists throughout the years. Michael Frasca at his studio in Cincinnati, Spring Street Pottery. His work ethic and high standards have served me well over the years. I followed Mike to Lexington, Ky where I assisted him and his partner Zoe Strecker at their newly established studio and farm near Shaker Village. Both absolutely brilliant and amazing artists. In 2004 I moved to Phoenix with my wife Stephanie. I finally made my way over to the Mesa Arts Center and back to clay. The MAC had just built a small wood kiln. Jack Troy led a weekend workshop and that was it for me. 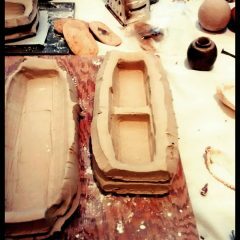 I haven’t considered firing my ceramics any other way than in an atmospheric kiln after that. The MAC enabled me to connect with so many great artists and people. Takashi Nakazato and his assistant Kazu Obas’ influence on me has been profound and lasting. This is how I came into initial contact with Don Reitz. It was no more than a handshake and a hello, but it’s why I’m here at the ranch now. I never again wanted to let an amazing opportunity pass me by as I did then. I am so honored and joyous at what these next chapters in my artistic and professional lives have in front of me and my family. The adventure beginning anew as the newest long-term resident artist at Reitz Ranch. Along with the rest of the Ranch family, I hope to grow and shape the ranch into something that Don Reitz would have been proud to look down on from his picture window up at the house. If you’re having trouble registering please call 602-882-8553. Reception can be spotty out here at the ranch, so be sure to leave a message if you don’t get an answer. You can text to that number as well or fill out the form below. – RR will offer a full refund of registration/class fees if cancellation is made at least 48 hrs. in advance of first class. – If cancellation occurs less than 48 hrs. prior to the start of a class, participant will forfeit 50% of the total class fee, or, at the request of participant RR may credit the total amount to be used on alternative class at a later date. – If cancellation or no-show occurs once the class has commenced RR reserves the right to withhold all Fees paid by participant. However, RR understands that extenuating circumstances may occur and will make every effort to take these into consideration. In some cases, participant may be eligible to receive a partial or full credit towards another class.